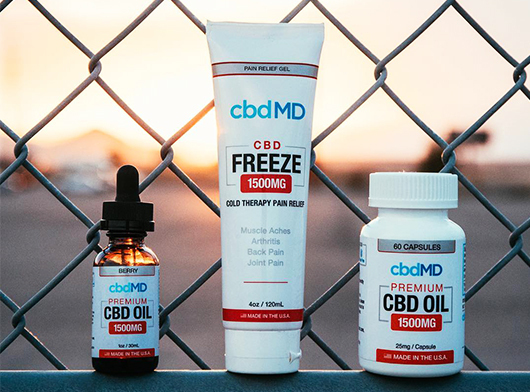 U.S based, cbdMD has been growing and producing CBD oil for years. Their ethos of ‘home grown’ hemp has encouraged a large customer base who are looking for an ethical yet effective CBD oil. What’s even better is their affordable pricing. So, whether you need a soothing CBD moisturizing lotion for irritated skin or some potent CBD capsules to relieve you of pain, all the products are very accessible. In this complete cbdMD review we will be exploring the history of the company, their personal take on growing the best quality hemp, and giving an overview of all the products they sell on their website. cbdMD believes in growing top quality U.S hemp. As a member of the Kentucky’s Industrial Hemp Pilot Program, they have been sanctioned strict harvesting guidelines to ensure that every plant is grown to their high standards. Their decision to grow in the U.S is a passionate topic for cbdMD; choosing to grow locally means they have much more control over the growing process and can also support the national hemp industry by providing jobs and obtaining much more knowledge about hemp. The hemp plant is harvested in partnership with the Kentucky Department of Agriculture. This ensures that no synthetic pesticides, herbicides or growth-promoting antibiotics are used during the growing phase of the hemp plants – the resulting product is 100% organic. Lastly, we learned during our cbdMD oil review that the company’s hemp is used to create a very pure CBD oil without any dangerous chemical residues or unwanted solvents. Companion Box: As well as their extensive range of CBD products, cbdMD also sells a ‘companion box’. The box includes a CBD oil for yourself and also an oil for your pet. Not only can you make savings of up to 20%, but the quality packaging also makes it perfect for a present. Pricing comparison: As mentioned briefly before, cbdMD products are a very reasonable price. If you are curious about how their prices match up to other competitors, you can browse the comparative chart on the website, where you can also check the prices of other large sellers of CBD. CO2 extraction: cbdMD uses a method called CO2 extraction to make their CBD oil. Although this is more expensive, it often means a purer oil with less chance of it containing dangerous solvents. Lab testing: The company aims to be as transparent as possible. All their products undergo extensive, independent third-party lab testing to ensure all the products are both safe and of a high-quality. Award-winning: If you need any proof of this brand’s quality, we can look at the multiple awards they have won. We found out during our cbdMD review that in 2016, the brand won awards for ‘Best Flavor’, ‘Highest Quality CBD Oil’, and ‘Reviewers’ Choice Winner’. This is pretty substantial evidence that they know what they are doing! Compared to other brands, cbdMD oil is relatively accessible for North American buyers. Not only can you choose 3 different delivery options, but if you are willing to wait up to 7 working days you can get the delivery for free! But one of the disappointing aspects of the company is their lack of international delivery. This is especially frustrating because they produce award-winning oil that has the potential to be very popular in other markets. 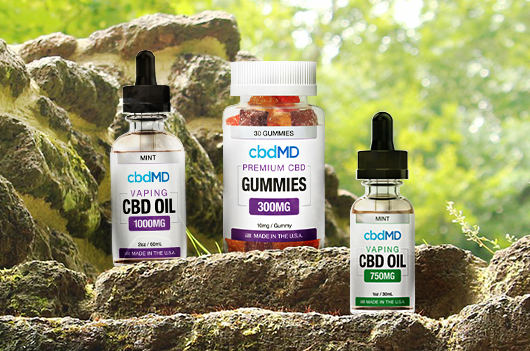 CbdMD CBD Oil Tincture Drops: These drops come in 4 delicious flavors; natural, mint, orange and berry. We love seeing more flavored oils on the market, as the natural taste of CBD can be very off-putting for potential buyers. You can buy the drops in both 30ml and 60ml bottles, as well as a broad range of potencies. 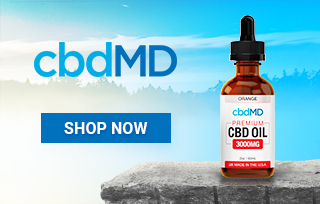 CbdMD CBD Oil Capsules: You can buy these in both 30 and 60 capsules bottles. They contain broad-spectrum cannabinoid oil, with a wide range of different terpenes and amino acids. You can really tailor-buy the right product for you, as the capsules come in a whole range of potencies. CbdMD Bath Bombs: These are a really fun product to either use yourself or gift to someone else. With 6 different colors and scents to choose from, they can be a great addition to a relaxing bath. Great for those aching and sore muscles! CbdMD Oil for Animals: The website sells a variety of animal-related CBD oils aimed at dogs, cats and horses. These come in lots of different flavors to entice your pet to consume it, as this can be a major issue for a lot of owners. Whether your pet becomes anxious in the car or they are healing from an injury – these could be an option to pursue. cbdMD is a company who has very high standards when it comes to their CBD oil. Guided by the Kentucky Department of Agriculture, the company has developed a top-quality oil by looking after the plant from seed to bottle. Aided by the fact that the growing process is completely pesticide and chemical free, each batch is given extensive lab testing. It’s not surprising then that they have been awarded highly for the quality of the oil they produce. So, if you are looking for a company with lots of flavorful products and that isn’t going to break your piggy bank – this could be the one for you. It is our sincere hope that you found this cbdMD oil review to be helpful and informative – not many companies out there on the market today have taken the steps they have to produce such a top-notch end product, and we do not hesitate to recommend trying them out if you’re looking to get into the therapeutic potential of CBD. I tried cbdMD CBD Oil Horse Tincture on my horse and he absolutely loves it. I can sense the mood change in him, and as a result his perfomance is much better. I always go back to the 300mg capsules, at $29.99 they are such a good price. Happy days. I use the 750mg Freeze Pain Relief for my post-run remedy – works like a charm. Do you despise aching and sore muscles after a heavy workout? I recommend using cbdMD bath bombs in your post workout bath, it will send you into blissful relaxation. I’m considering investing in the CBD bath bomb multi-pack, would save a lot of money and I will definitely use them all! Averie from Ashburn just bough! Nathan from Ashburn just bough! Chase from Ashburn just bough!